Looking for a way to add some serious curb appeal to your home? Consider painting your entry door. Painting your entry door is a unique way to make your home stand out. Depending on the color of your home, there are a lot of options when it comes to choosing a paint color for your door. What Color Entry Door Should You Choose? Black – A classic black entry door can really make your home stand out, especially if you have a white exterior. The contrast of a light exterior and black door will really make your home stand out. Red – A red door is a classic choice, and probably the most popular color choice for brightly colored front doors. 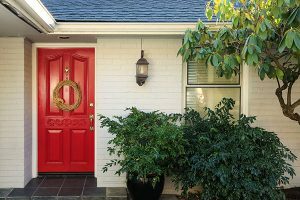 A red door can complement a variety of exterior home colors, and is actually a fairly neutral choice as far as brightly colored doors go. Blue – Blue is a very versatile choice for an entry door, as you can choose from a variety of different shades. Depending on the color of your home and/or shutters, choose the shade of blue that best complements the exterior of your home. Pink – Pink is highly unconventional as far as door colors go, and you might be thinking “I don’t live in a Barbie house….” But, trust us, when done correctly, pink entry doors can be really appealing. Green – Go green for another classic choice, like red. Deep, dark greens are fairly neutral and will add some personality to your home without being too overbearing. You could also go with a lighter shade of green if you want. Either option will add serious curb appeal to your home. Yellow – Yellow is said to be a serene color, associated with sunshine and peace. It is often used in marketing materials to invoke feelings of happiness in consumers. Painting your entry door a nice shade of yellow just might have the same effect on you and your guests! Grey – Grey entry doors are a sort of blank canvas. A very neutral, classy choice. Choose a shade of grey that complements the rest of your exterior. If you’re unsure, a medium grey is usually a safe choice! Purple – Like pink, purple entry doors are fairly unconventional and unique. Purple signifies royalty in certain countries, and is often used to represent wealth and power. A purple entry door, when done correctly, will really make your home stand out. Orange – Another fun choice is an orange front door. Not as unique as pink or purple, but still bright and fun just the same. With the right shade, an orange entry door will add a nice pop of color to your home. Two-Tone – Last but not least, if you think solid color doors are boring, you could always do a two-tone entry door. Choose colors that complement each other, or do a neutral color with a pop of something bold. Painting your entry door is an incredibly simple and easy way to make your home stand out and add serious curb appeal. If you’re on a budget, or simply can’t find the perfect color door to purchase, painting your already existing door makes for a great weekend project! For those looking to replace their doors Chicago homeowners should stick to steel or fiberglass doors because they can be customized in many different colors and styles. PRO TIP: paint the interior as well as the exterior. They don’t necessarily need to be the same color. Add a little pop of color to the inside of your home as well as the outside! ©2018 Contemporary Front Doors. All Rights Reserved.